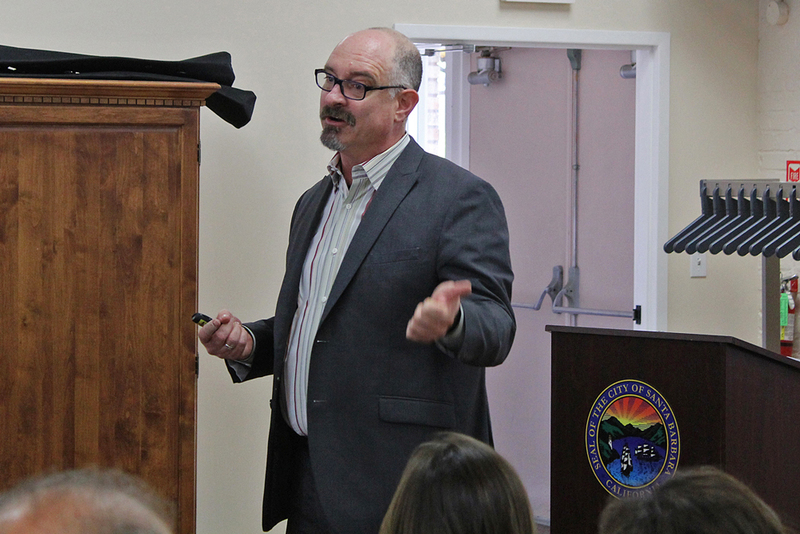 It was standing room only in the Louise Lowry Davis Center on Wednesday morning for a community discussion on homelessness, an issue that has increasingly bubbled to the surface in Santa Barbara and has left State Street-area businesses clamoring for greater assistance dealing with what they say is aggressive transient behavior. The stakeholder meeting was geared toward downtown businesses and property owners, who come face-to-face with homeless individuals on a daily basis. “Nuisance behavior has been a problem on State Street since I was hired in 1991,” said Santa Barbara Police Lt. Ed Olson, who pioneered Santa Barbara’s restorative policing tactics. Olson said that type of policing, which aims to fight homelessness by connecting individuals with services to get them on their feet, has reduced the number of homeless individuals in the city and has become a model for other cities’ approaches to homelessness. According to Chuck Flacks, the executive director of the Central Coast Collaborative on Homelessness, Santa Barbara has seen a 24-percent decrease in its homeless population since 2011. Calls for service related to homeless individuals dropped more than 80 percent along the Milpas Street corridor after mom and pop businesses there committed to aiding the restorative approach, Olson said. The problem still persists throughout the city, and officials used the meeting to lay out the approaches City Hall, law enforcement, health services and housing organizations are taking to get people off the streets and deal with out-of-towners who badger passersby. Last month, police Chief Lori Luhnow announced that two officers had been committed to a downtown foot patrol to respond directly to people’s concerns. Olson explained, however, that homeless people will only take up services and housing opportunities if they want them. “We need to recognize that as long as it is financially beneficial for some of these people to be on the streets, they are going to continue to do so,” he said. The lieutenant proposed large-scale messaging campaigns that would be done in conjunction with businesses that would educate consumers and tourists, asking them to redirect their handouts to services that actually do demonstrate results, instead of giving people money directly. Alice Gleghorn, who heads the county’s Behavioral Wellness Department, emphasized that authorities couldn’t incarcerate their way out of the problem, as many homeless individuals suffer from mental health and substance abuse issues. On top of that, many of the nuisance behaviors businesses and passersby find problematic have been decriminalized under California law, which Olson said leaves transgressors little incentive to change their behavior when they know there will be few, if any, repercussions. “We have to find a way to sever that financial availability — that funding stream that keeps them basically living that lifestyle,” he repeated. Discouraging traveling homeless individuals from stopping in Santa Barbara allows agencies and organizations to better target their resources to Santa Barbarans who have fallen on hard times, Olson added. Flacks called the homeless population a canary in the coal mine for housing shortages. “Part of the reason we’re all here is that we have a housing crisis in this county,” he told attendees. Los Angeles, home to a substantial homeless population, is a model for how to tackle the issue, Flacks said. Voters there overwhelmingly approved $1.2 billion in bonds to provide housing for the homeless, as well as a quarter-cent sales tax increase to provide services and programming. In Santa Barbara County, Flacks said, 85 percent of formerly homeless residents who get into housing stay there, as they’ve achieved the most important requirement to stabilizing their lives. Several business owners at Wednesday’s forum asked officials to pursue cheaper, shorter-term fixes, like providing better lighting at night and the removal of benches in front of their storefronts, which many homeless hang out on. Officials emphasized that the city’s homeless population extends beyond those panhandling on State Street. Families with children cycling in and out of affordable housing are also in need of services, especially stable housing, speakers said. Sue Gray of the city’s Community Development Department reported that the city puts $3 million a year toward homeless-related services, including restorative policing, emergency shelters, tenant-based rental assistance, dental care and encampment clean-up. Another $34 million has gone toward permanent housing support, chiefly to the Housing Authority of Santa Barbara, with funds primarily from the now-dissolved redevelopment agency.